It’s the Diwali Holidays see, and take advantage of things going well at work, and a bit of a lull to take an additional couple of days off. Well it started off with a Friday off, then extended to Friday and Monday, and then became a whole week off thing. Had no clue what I was going to actually do, but get in some Cycling was always at the back of my mind. Am not in peak condition, so even though the intent was to do some silly long distance riding, I kinda thought that it would fizzle out. Why? I know I would get grief if I headed out during Diwali and the festivities around it, Dhanteras, Laxmi Puja, Bhaubeej, etc. So I sort of just mentioned that I may go away riding for a few days, and even though the kids know I am prone to do some crazy stuff, I think my folks wished that some sort of sanity would prevail. Whereas they have no objections to my riding (well they didn’t back then), they have never been able to get what I get out of pushing myself mentally and physically beyond all reasonable limits. So sorry Faizal, I will not yield, at least not yet. WHY SWITCH to A ROADIE!!!!!! Back in the day I was known in the circles as a bit of a “hard-core” type, since I ride hard and fast, and simply refuse to move away from my Iron Horse – Warrior Pro to anything else. Road Bike? No. Hybrid? No. I’ve been told its time to graduate, but, hey I love the feel of an all steel heavy bike, wide tires, and I say, I get a harder workout in a much shorter span of time, so why upset the apple cart? Sorry, I was rambling wasn’t I? 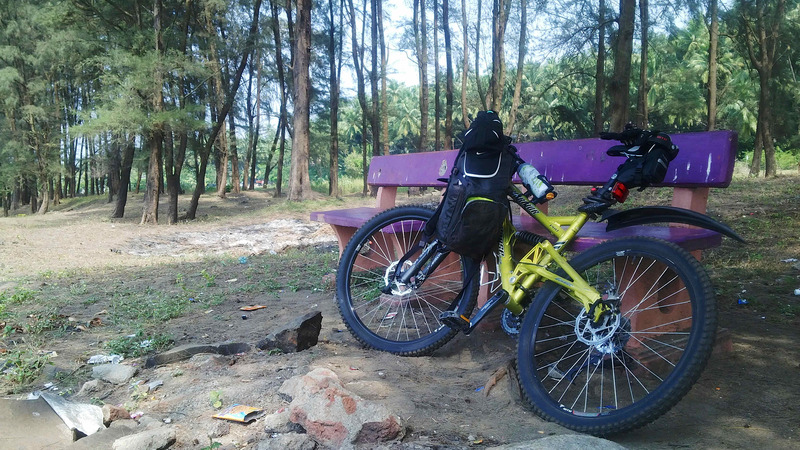 Ok, ok. Dragging myself back to the topic for today’s blog, The Ride to Janjira and back. I did ride finally, but the objective to ride all the way to Srivardhan and back, turned out to be a damp squib, for several reasons. For one, my dear mother, gave me grief, my dad laughed like I was a bit daft, and then da mudder asked the question “What will I do at home”? She goes, stay home and take care of your old parents. Couldn’t argue much with that on the phone, so abandoned plans and just did the Janjira bit. The other practical reasons why Srivardhan and Harihareshwar didn’t happen, is that it was really hot, the roads were totally broken for long stretches, so whatever riding I did, posed a direct threat to the Crown Jewels. So if left home (Bandra) at about 3 PM on Wednesday, Nov 6 2013, had my customary start-up coffee at Gloria Jeans, and finally left for Gateway at 3.45 , arrived in time to catch the 17.30 ferry across to Mandawa. I wanted to ride to Janjira or at the very least Revdanda, the same day, but as I realized, it was pitch black when I landed at Mandawa Jetty, and had to ride to Alibaug under well, not ideal conditions. Reached Alibaug at about 19.30 and spent about an hour and a half finding a reasonably priced Hotel to stay. Let’s make a long story short, I now know every street in Alibaug. Stayed at Ravikiran, who gave me a hefty discount for the overnight stay, with my plea of, “Me phakat ratri jhopnar, ani sakali breakfast pan nahi ghenar (hey, I’m just gonna sleep the night, and will leave well before breakfast)”. Downed a bottle of beer, several poppadams, and a nice dinner, and thought I’d sleep like a log and wake up all fresh and head out by 6 AM on the 7th. Sleep didn’t happen until 4 am as my second wind had kicked in after riding about 40+ km. So I’m now headed down the road and after a steady start, hit the broken concrete hard. Hoping beyond hope that this will end sometime soon, I was only to be disappointed. 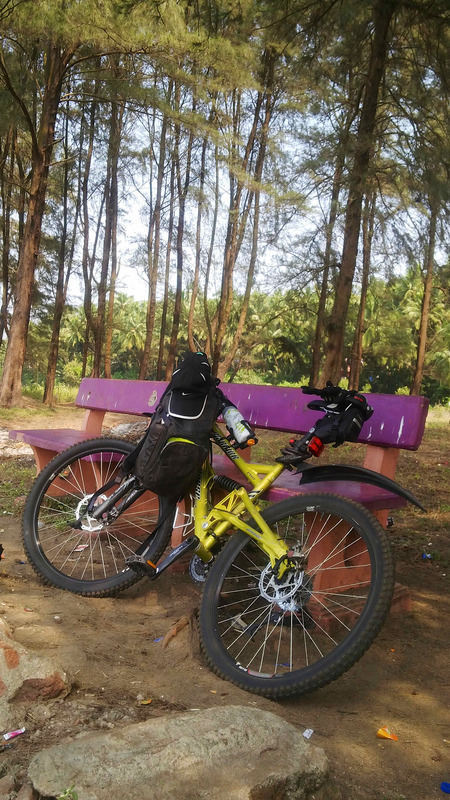 The only good thing is the ride on the Iron Horse – Warrior Pro, with its really rugged frame, dual suspension, modified crank and new hubs, and of course the fact that I was leaving the crawling traffic behind. Courtsy Faizal (The Chief of Pro9 fame), and this is not advert, he’s good. I took the right to Revdanda and was soon at the far end of the beach. It was really fantastic, barely a soul so I had the beach all to myself. The big disappointment was the filth people had left behind at the beach, spoiling a pristine stretch of beach. Dismounted, found a few benches and stopped for some Gatorade which I’d frozen in the freezer the night before. Well I couldn’t hang around for as long as I’d like so took some pictures and moved on. The 36 km from Revdanda to Murud wasn’t exactly a cakewalk at that time of the day, with the sun beating down overhead. We aren’t forgetting the “stay home with the old parents” bit now are we? So regretfully, barely had I touched Janjira after taking the ferry to the other side, I had to make my way back, instead of making the big push to Srivardhan at least if not Harihareshwar. A Story of Heat, Missed Turns And a LONG Ride Back Home. 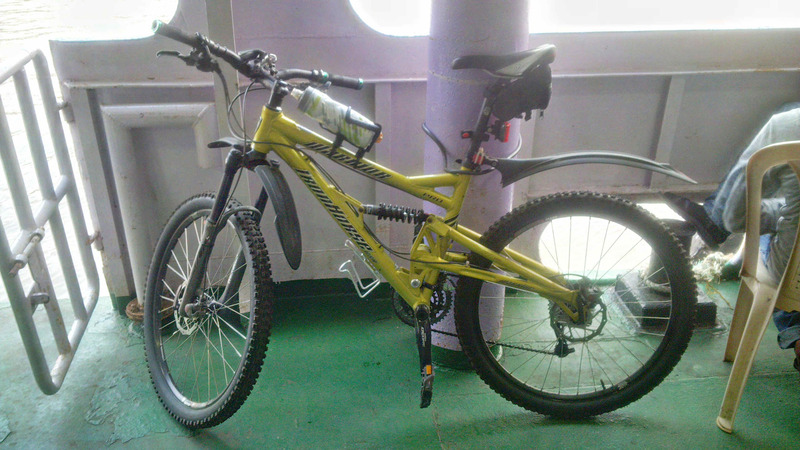 The ride back was the stuff to speak of not so much the ride to Janjira which was, well, a piece o cake. Truth be told, I really had barely any recollection of the ride from Mandawa to Alibaug, being focused on riding in pitch darkness, save my headlamp. So no wonder that I had not noticed that there is this very long, gradual, but VERY LONG uphill before you hit the down-slope into Mandawa. I even almost gave it up and dismounted, but I knew that it would be not so wise, so I plodded on and on. What goes up must come down at some point right? FINALLY I hit the down-slope, and coasted for several minutes and the second wind hit me, and by now I was at a steady clip. So steady in fact, that I overshot past the turn to Mandawa, and not by a mile by 18 KM. Succour came in the form of a stall selling cold solkadi, and then a gannawalla, and I generously partook. So when I figured that I’m not just 17 KM off the turnoff, but from the backtracking, I would need to add another 22 KM to reach Mandawa, I had to weigh the balance between riding back or moving ahead. No I did say I’m a diehard didn’t I? I asked for it and moved ahead. From the point at which I’d stopped, to Wadkal Naka was a mere 5 KM or so, and from there to take the Pen-Panvel bypass to Kolva to Sea Woods Estate was no mean feat! Then once I hit Vashi, the traffic deterred my swift movement, and after getting incessantly ensnared at Chembur decided to backtrack to Vikhroli – LBS – BKC and then finally Bandra. The customary end to any ride as with the beginning is a cold coffee at Gloria Jeans, where I catch my breath and then head home, as so that is what I did. Very sore, very tired, don’t know when but happen it will, and ain’t going to give in to any “requests (read emotional blackmail from da mudder)” this time around.